Home » How Should Stone Crabs Be Prepared? Resources > How Should Stone Crabs Be Prepared? Florida Stone crabs are annually harvested and sold by both professional and recreational crabbers. Eventually, the claws of a large percentage of these crustaceans end up on someone’s plate in some form of stone crab dish. Approximately 2 ½ pounds cooked Florida stone crab claws will typically yield around one pound of juicy claw meat. These claws are famed for their delectable flavor. This delicacy has tender succulent meat that has a very buttery texture. Once you buy Fresh Stone Crabs, there are a number of different ways you can cook them. The most conventional and common way to prepare Florida stone crabs is to sauté or steam the claws which can be served with either just butter & lime or a creamy mustard sauce. However, stone crab claws can be served cold too, on a bed of ice with a dip of your choice. Although cooking Florida stone crab claws isn’t necessarily a major challenge, timing is one thing you need to focus on. Get that wrong and you can ruin the texture and flavor of the meat. Here we take a look at some things to keep in view and steps to follow while cooking this amazing seafood. Not only do we at Fresh Stone Crab ensure that our customers get the very best stone crabs in Florida, but also that they are able to enjoy them in the best possible way. 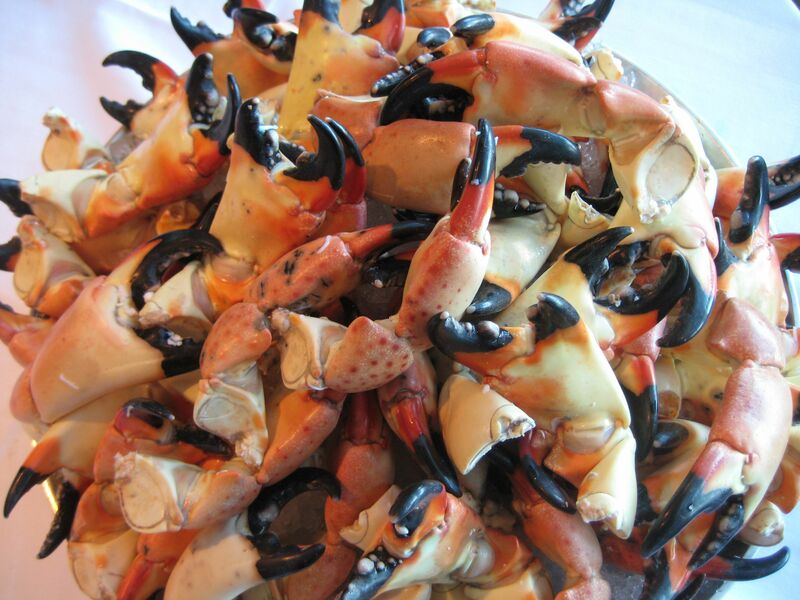 This comprehensive stone crab claw cooking guide aims to help in this matter. When you receive the package of Florida stone crab claws, there are some things you need to do before you actually cook them. Keep in mind that the claws are flash-cooked before shipping and overheating them for too long will only ruin the flavor & texture of the meat. Follow these steps in order to maintain the overall freshness of your stone crab claws. Remove all the Florida stone crab claws from the wraps/bags. Rinse them thoroughly under cold running water. Allow them to dry for approximately 10-15 minutes before you put them in a large bowl. Add some cold water to the bowl and some ice cubes or simply allow the bowl to sit in the refrigerator for an hour before cooking. Make sure that the stone crab claws are at a temperature of below 40°F. These are the best cooking methods to ensure the crab meat stays succulent and that the water texture of the beautiful meat is maintained. Most people won’t season the claws before steaming or boiling. It’s far better to serve this delicate meat with a sauce after you have steamed or boiled the claws. Put the 2 cups of water in a cooking/steaming pot. If you’re using a larger pot, use the colander. It will help to keep all the crab claws well above the water level in the pot. Bring the water to a quick boil and place the Florida crab claws in the pot. Cover your pot and then steam the claws for approximately 10 minutes. Turn off the heat as soon as you smell the delicious crab meat and take the claws out of the water. Make sure you don’t steam or boil the crabs for longer than mentioned. Heating them for too long will only ruin the meat. This method works well with our chilled crab claws rather than frozen ones. This is because most microwaves provide much more heat to the core of the foods being cooked. Too much time in the microwave can result in overcooking of the core of the meat. Prepare all the stone crab claws before heating. Place all the thawed crab claws on a microwave-safe dish. Spread them out evenly on the plate- this will help to ensure the distribution of heat and optimize the cooking effect. It’s best to have only about one pound of crab claws for each microwave turn. Heat all the stone crab claws in your microwave for 2 minutes at a medium setting. Serve the dish immediately after heating. Note- If you have a high-power microwave, it’s important that you crack the claws before heating or else they’re likely to explode. If you’re using the meat a little later, cover all the claws with thick plastic food wrap, leaving only one small corner open for the steam to escape. This also helps prevent the crabmeat from drying out. Grilling or baking the stone crab claws is an excellent way to have succulent & firm meat. If you prefer the crabmeat to be less watery than regular boiling, steaming or microwaving. If you’re going to bake the Florida stone crab, first preheat your oven to 350°F. Put the claws for about 5 minutes on a medium heat grill (for each side). Maintain the grilling temperature at 300-325°F. It’s also a good idea to baste the crab claws with olive oil while grilling. Place all the claws on the sheet pan or shallow pan. Make sure you just lay them flat on the pan and don’t stack them. The latter is will only result in uneven heat distribution. Pour the hot water, and cover the pan with aluminum foil. Bake your stone crab claws for approximately 10 minutes. It’s important that you check them a couple of times while they are in the oven. Grilling and baking them will give you tender, sweet and succulent meat. But if you overheat them, that will only cause the meat to lose its flavor and texture. Use a mallet or the back of a big heavy spoon to lightly crack the claws and the knuckles. You don’t really need to use the hammer. It gives too much force and will ruin the meat inside the shell. Wrap a paper towel onto the claw to be able to hold it more firmly when cracking. It’s better to give the claw some whacks on both sides of it. This will help you to peel off the shell easily without damaging the meat. Cooking the stone crab claws is not a tough task, but you need to put your eyes on it. Steaming, boiling, microwave heating, baking and grilling are all basic cooking ways. But the most important thing in cooking the stone crab claws is the timing. Overheating the meat is what you should always avoid. These tips will hopefully offer useful instructions on how to cook stone crab claws properly. Enjoy your cooking!